Sloshing through the streets of Bern, Switzerland, on a particularly wet day and getting more than a bit drenched, the sight of an arcade appeared like an urban oasis. I stepped into the dry arcade for a little relief and to get a better look at what I’d been passing by without the inconvenience of a waterlogged umbrella. My respite also resulted in an impromptu purchase from one of the shops here — an emerald-green–faced watch with an unusual cork case and lugs that I still own today, more than 20 years later. Arcades — rows of connected arches that provide protected walkways — can be traced back to the ancient Greeks and Romans (you can still walk along them at the Colosseum). Since then, this architectural element has spread throughout the world, in churches and mosques, courtyards and city streets. They’re a practical idea, as I found out in Bern — you’ll catch a break from Mother Nature when she’s not cooperating. They also encourage you to spend more time outdoors, now that you’re protected from, say, torrents of hail or relentless sunshine on a ferociously hot day. And, of course, they’re quite beautiful, adding an elegant presence to their space. These are my favorites. This masterpiece of Gothic architecture remains one of the most identifiable buildings in the world. Whether I was viewing it for the first time from among the throngs in the Piazetta San Marco or 23 years later aboard a vaporetto on the Grand Canal, the Doge’s Palace always struck me as the epitome of so much of what Venice represents — intriguing history, influential architecture, and style that’s hard to match. The long façade on two sides bears the building’s signature pink and white diamond pattern and its rows of perfect quatrefoils. But it’s the street-level arcade and the second-story loggia that really set it apart. 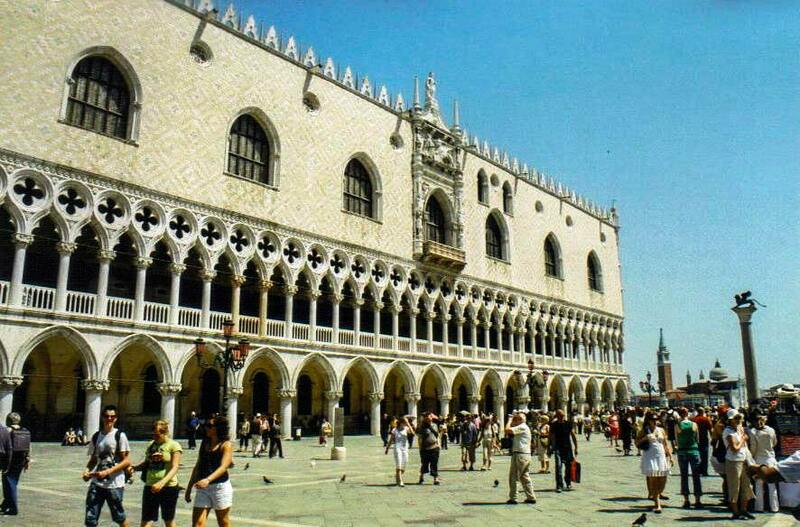 On the ground floor, short Corinthian columns separate 17 arches on the canal side and 18 facing the piazetta, creating a seamless arcade that provides a little breathing space from the crowds feeding pigeons, buying souvenirs, and lining up for entrance into nearby St. Mark’s Basilica. At the corner, a relief sculpture of Adam and Eve watches over everything, with her pointing to the forbidden fruit and he raising a hand in initial reluctance. On the second story, the arches, separated by Corinthian columns and breaking the line of balustrades, become narrower and more Venetian in style: 34 face the canal and 36 overlook the piazetta. But the arcades don’t end there: Go inside the palace and then step into the interior courtyard, where the ground-floor arcade and second-floor loggia almost entirely frame the open space — a dazzling and virtually uninterrupted flow of arches, balustrades, columns, and oculi. 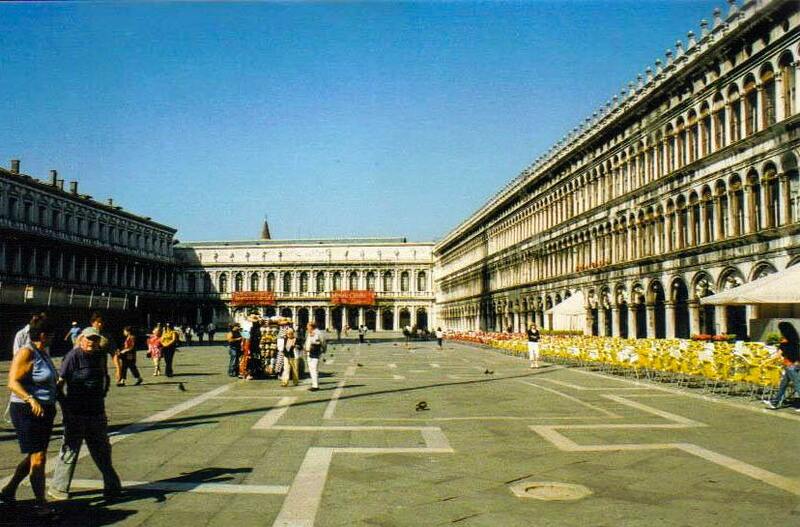 Adjacent to the Piazetta San Marco, this famous square sees about 20 million tourists per year, many of whom flock to St. Mark’s Basilica, dominating the eastern side of the piazza. Arcades frame the remaining three sides along the ground floor of three connected buildings — a gorgeous U-shape collection of beautiful arches, columns, sculpted figurehead keystones, and sculpted figures in the spandrels that spans about 500 feet in length by approximately 200 feet in width, enclosing the majority of the piazza’s 130,540 square feet. On the north side, the arcade of the Procuratie Vecchie building provides a pleasant walkway past shops and cafés, including the famous Caffé Quadri, established in 1775. Opposite it on the south side on the ground floor of the Procuratie Nuove, you’ll find similar shops and cafés under the protection of the arcade, including the iconic Caffé Florian, opened in 1720. Between them, the arcade of the Napoleonic Wing leads to the entrance of the Museo Correr, a fantastic museum that boasts a grand collection of Venetian art, life, and culture as well as an unbeatable view of the entire piazza from its second floor. 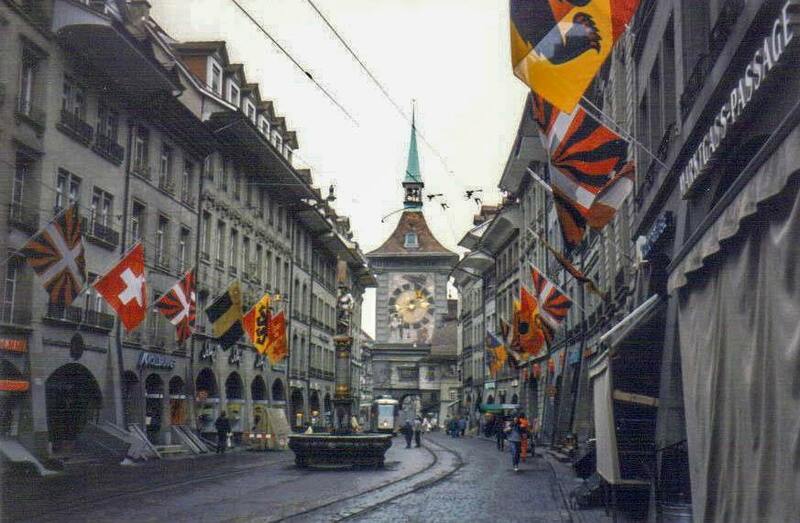 Strolling through the Old Town of the capital of Switzerland is a pedestrian’s delight, thanks to its many sites and curiosities but also to its nearly four miles of arcades, one of Europe’s longest covered shopping promenades. Unlike those in Venice, these sandstone arcades are not particularly interesting from an architectural stance — some are plain, others are rusticated, and they vary in size and shape. They are, however, extremely functional and highly beneficial when it comes to appreciating the Old Town’s highlights when the weather turns against you, making a stroll around this UNESCO World Heritage Site truly delightful. High prices for goods in the specialty stores, boutiques, and galleries along the arcades will keep your shopping to the window style, but, from under their shelter, you can appreciate key sights along such streets as Spitalgasse and Marktgasse for free, including the Zytglogg, one of the world’s top 10 clocks; the prison tower; and the city’s collection of Renaissance fountains, commemorating Swiss heroes, allegorical figures, and historic events from the Middle Ages, that used to serve as meeting places where folk gathered to gossip, bathe, and obtain clean drinking water, and that today prevent drivers from speeding: The fountains are placed dead center in the middle of the streets. Stepping into the Ancient Spanish Monastery in Florida was like time traveling back into 12th-century Spain. With nary another visitor in sight, the meditative quiet enshrouded me, like a European monk deep in contemplation from nearly a millennium ago. Completed in 1141 in Sacramenia, Spain, the monastery functioned until the 1830s. A century later, William Randolph Hearst purchased the entire complex and had the structures dismantled stone by stone, and sent to the United States. Before he could reconstruct it, however, Hearst got into some financial trouble, and he had to sell his purchase, which remained in a Brooklyn, New York warehouse for 26 years. Eventually, it was purchased by a couple of entrepreneurs and ultimately found its way to North Miami Beach, where it was reassembled like an outrageously oversized jigsaw puzzle. Within this structure, I found a positively peaceful chapel, with one of the world’s best Nativity scenes; countless stone capitals, no two of which are the same, as they were carved by different masons; a virtually silent garden; and, of course, one of the world’s best arcades. 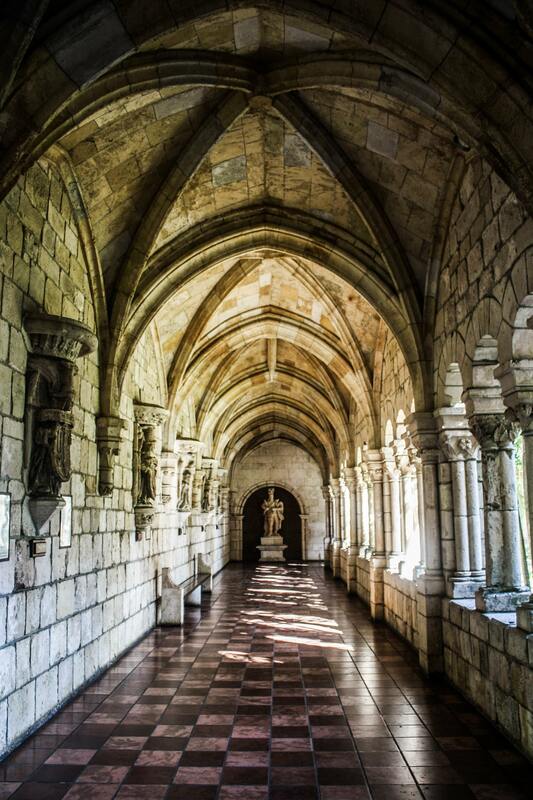 Within the Cloisters of the monastery, I walked along the tile floors of the arcade that frames the central yard. Above me, the ribs of the groin vault ceiling radiated down to sculpted corbels. I kept encountering unexpected delights: colorful coats of arms; highly detailed medieval statues, many wearing miters and bearing shields, affixed to the stone walls; a medieval bell that was rung to call monks to prayer and meals; and the 877-year-old statue of King Alphonso VII. A bench here or there allows you to sit amid all this ancient grandeur and peer out through the groups of columns supporting the arcade’s arches to the cloister garth and the prayer well (actually the top of a column from a second-century Roman temple) that sits smack in the center. Completed in 1365 after only five years of construction, the gargantuan Visconti Castle served as the stately and refined court residence of the Visconti family. Today, the brick castle is home to the Civic Museums of Pavia. Even if you don’t want to visit the museums (but you should), you should make a point of seeing the arcades. Cross the bridge over what was once a moat to enter the castle and keep going straight, into the tremendous inner courtyard. 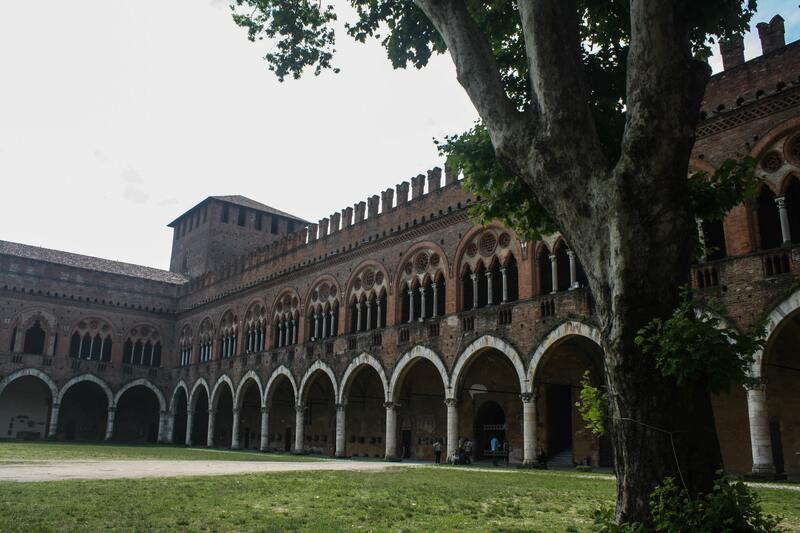 Although one section was blasted away during a long-ago war, the fantastic arcade wraps around three sides of the inner courtyard, a wide open space with some grass and a tree or two that seem to be in need of a little TLC. Under the vaulted ceiling of the arcade, I passed by tablets, capitals, and columns along the walls on one side and took in the views of the castle through the open arches on the other. Crennelated rooflines lead to sturdy corner towers. Above the uniform arcade, beautiful loggias of either twinned bays or two- and three-mullioned terracotta windows with lovely quatrefoils run the entire length of the building. Although it looks like a fortress, features such as these testify that it was once quite a beautiful place in which to live.